Daniel Robert "Bob" Graham (born November 9, 1936) is a retired American politician. He was a well known member of the Democratic Party. Graham has never lost an election. His career started with being a state legislator (Representative 1966-1969, and Senator 1971-1979). In 1978 he was elected Governor of Florida. His Lt. Governor was Wayne Mixson. Graham was reelected in 1982, when he won 65% over a Republican candidate, Skip Bafalis. He was a popular Governor. He did much to protect the environment. He also oversaw restart of state executions (as first time since 1964), when 16 people were electrocuted. The first of them, John Spenkelink, was the first to die in the electric chair since 1966 in the United States. He was the second to be executed since 1967 (after Gary Gilmore in Utah in January 1977). Graham was elected to the United States Senate in 1986, defeating sitting Senator Paula Hawkins. 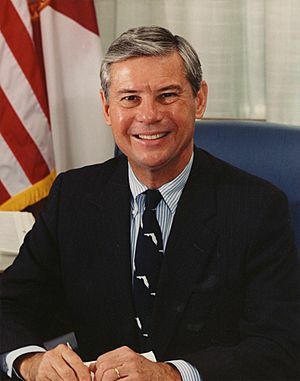 He served as Senator from 1985 to 2005, when he retired. He resigned from governorship on January 3, 1985, three days before the swearing-in of the governor-elect, Republican Robert Martinez. For this time Mixson assumed his duties, making him the shortest serving governor in Florida history. From 2001 to 2003 Graham was a chairman of the Senate Select Committee on Intelligence. In early 2003 he decided to run for President but, after poor results in an opinion polls, he resigned and later supported John Kerry, who won the Democratic nomination. He was regarded as possible Kerry Vice Presidential candidate, but Kerry chose John Edwards. Graham voted in 2002 against intervention in Iraq. Bob Graham signing books at the Miami Book Fair International 2011. Former Senator Graham (center), with former Florida Governor Buddy MacKay (right) at the dedication ceremony for Pugh Hall, home of the Graham Center for Public Service at the University of Florida. Bob Graham Facts for Kids. Kiddle Encyclopedia.